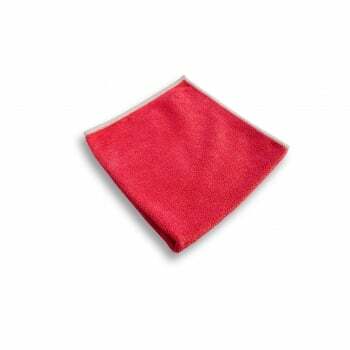 Red cloth ideal for cleaning URIMAT urinals along with URIMAT MB ActiveCleaner. The Ecoprod microfibre cleaning cloth cleans, dusts and polishes without chemicals, offering sparkling results with just water and making it extremely environmentally-friendly. For windows and mirrors, use cloth slightly wet. For cleaning of dried-in dirt or fat stains, wring out cloth in warm water. For dusting use cloth dry, works with static charge. For best result wring out cloth in warm water and use damp/slightly wet. For dusting use cloth dry, works with static charge. This cloth is made out of the best quality microfibre. A new design with a unique side stitch for better shape and function. Available in 3 colours: red for toilets and washrooms, green for kitchens and bars and blue for general purpose/low risk areas.